Anaergia Inc., announced today that UTS Biogas Ltd., a wholly owned subsidiary of Anaergia based in the United Kingdom, has successfully constructed and commissioned a 1.5 MWel biogas facility at Dagenham, London, for its client TEG Environmental Ltd. The Dagenham facility, located on a newly developed site within the London Sustainable Industries Park, is a combination of in-vessel composting and anaerobic digestion technology. The facility can process up to 50,000 tonnes of organic waste each year. UTS and TEG have already successfully commissioned their first co-located facility in Perthshire, Scotland. 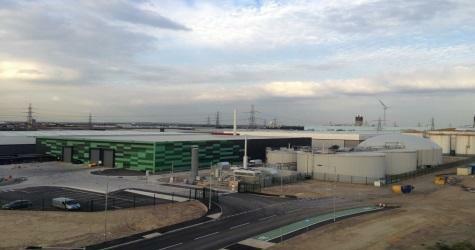 The anaerobic digestion plant at Dagenham generates approximately 1.5 MW of electricity, sufficient to power around 2,000 homes, together with heat for use within the plant and eventual export. It has been specifically designed for food waste with an upfront separation of organics from non-digestable materials such as paper, glass and plastics. A two stage anaerobic digestion process is followed by down-stream pasteurization of the digestate, so that the production of fertilizer meets the stringent PAS110 criteria. Anaergia is the global leader in recovering value from waste for the municipal, industrial, and agriculture sectors worldwide. Through its proven portfolio of proprietary technology, Anaergia’s integrated solutions create value for its customers in the forms of clean water, renewable energy, and quality fertilizers while dramatically reducing costs of waste management. Anaergia’s global headquarters are located in Burlington, Ontario, Canada, with regional lead offices in the United States, Germany and China. Anaergia technologies are in use at over 1,600 resource recovery facilities worldwide, reducing greenhouse gas emissions while creating new revenue sources for our clients.